Taco Metals, a trusted name in marine hardware, also fabricates beautiful marine pedestals, seats, and benches for OEM’s and dealers looking to provide a higher quality end product. For 2014, they decided the only way to meet growing demand from these existing customers, take on new OEMs, and maintain their custom, high quality appeal, was to automate. A seat fit for a captain! 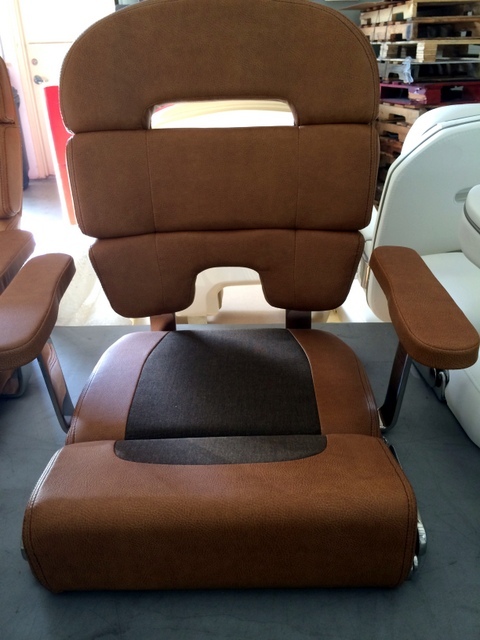 These beautiful chairs are available in a wide variety of colors, fabrics, and trim configurations. They want to provide custom options, without sacrificing quality, or delivery time. They were looking for a simple way to digitize existing physical patterns and then accurately mark and cut with a high level of repeatability. 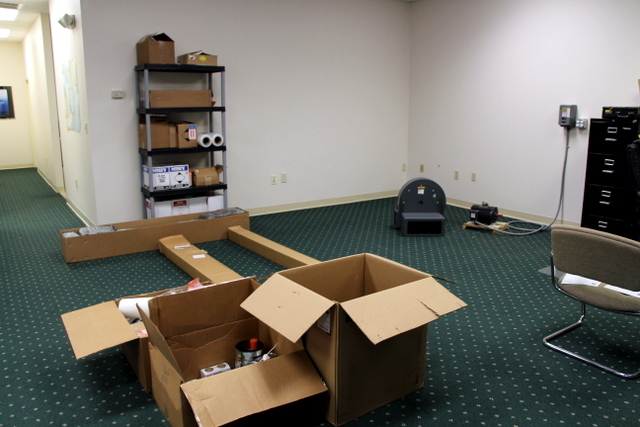 Their system needed to be installed in the front office of their new building and couldn’t take up a lot of space. 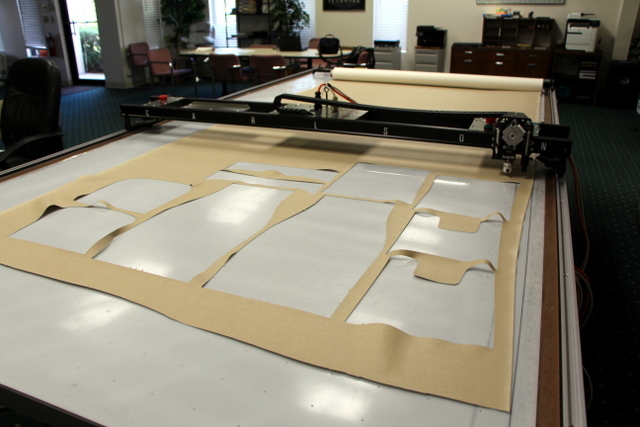 That’s OK though, because all of their patterns are cut from 54″ and 60″ wide marine vinyl and acrylic and since most of their orders are custom, nested pattern sets would be relatively small. 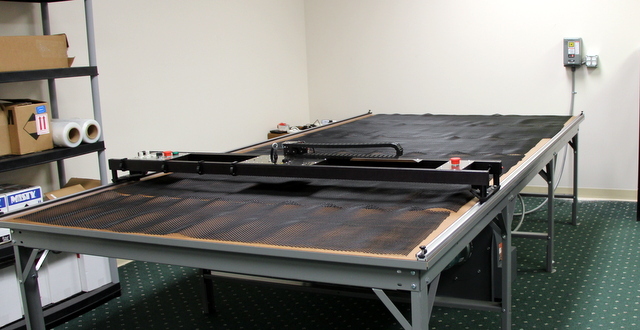 This made the Carlson Design Classic CTx-72″ plotter/cutter and T-Bar Digitizer on a 6’x12′ vacuum table the perfect choice for a small footprint system that was robust enough to handle continuous duty production cutting. 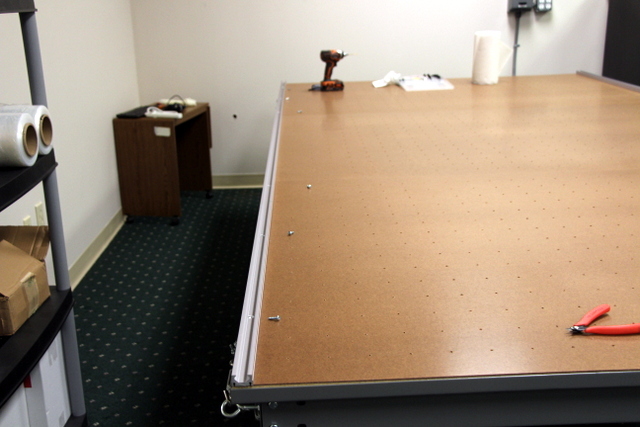 The 6’x12′ Phillocraft vacuum table fits neatly in the corner of their office. 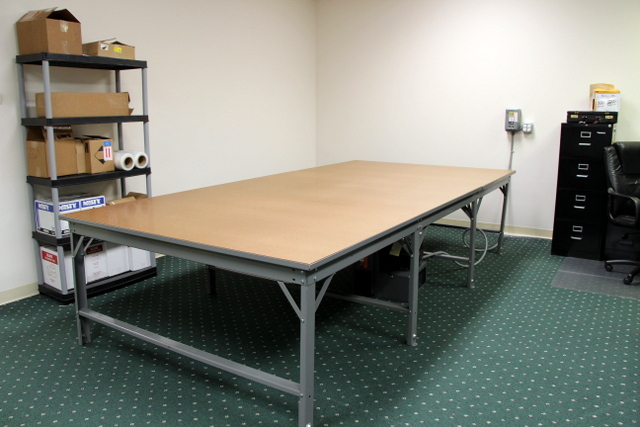 These tables come in endless 4′ long sections (12′ long = 3 sections), so it’s easy to expand the table later, if needed. 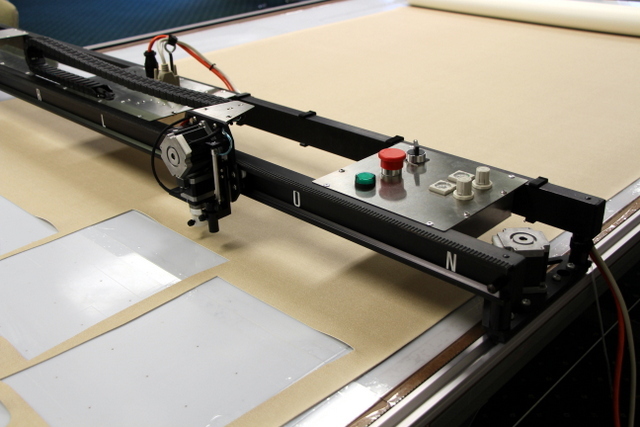 Carlson plotter/cutters are “clean” machines meaning they do not produce shavings, spit oil, or exhaust gasses. Like a big printer, the plotter/cutter is not out of place next to the copy machine and filing cabinet. In fact, it looks great! Don't you wish you had one of these next to YOUR desk! To get started, they need to digitize their existing physical pattern library. Simplify and stream line. They want to turn these physical patterns into digital nests, grouped, and categorized by part name and job number. 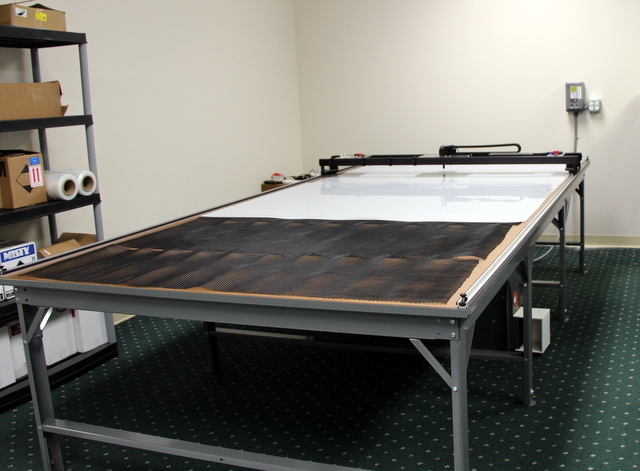 The T-Bar Digitizer slides in the same track as the plotter/cutter creating a 65″x130″ digitizing bed. The T-Bar is powered by USB and shows up in our Plotmaster Software suite when connected. When not in use, slide the T-Bar out of your track and hang it on the wall. 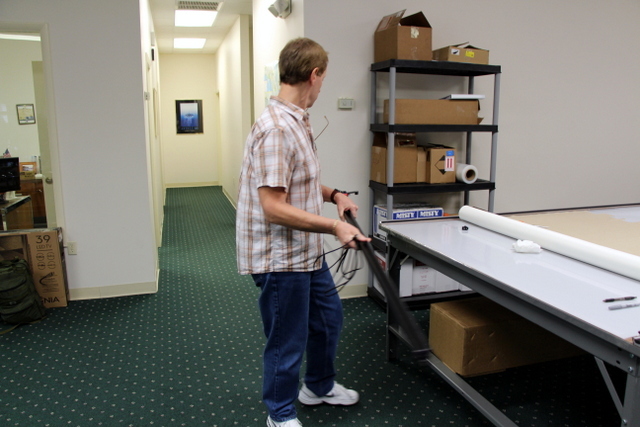 Slide the T-Bar into your track when you're ready to digitize. Light, Simple, and USB Powered. 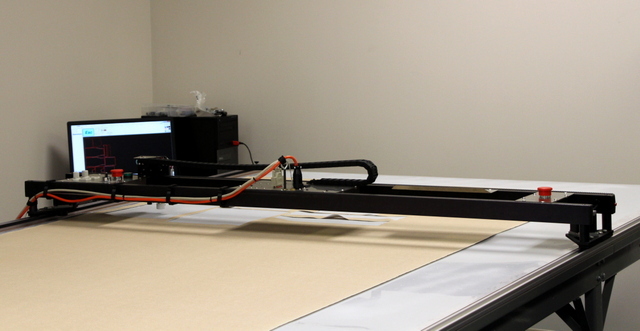 The T-Bar runs via Plotmaster USB (PMU), just like your plotter/cutter. 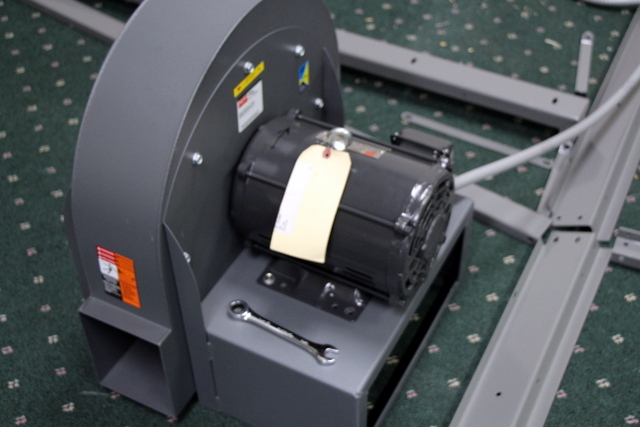 The T-Bar is very easy to use and does not require a “skilled” CAD operator. It has two buttons, one for plot lines (blue) and one for cut lines (red). 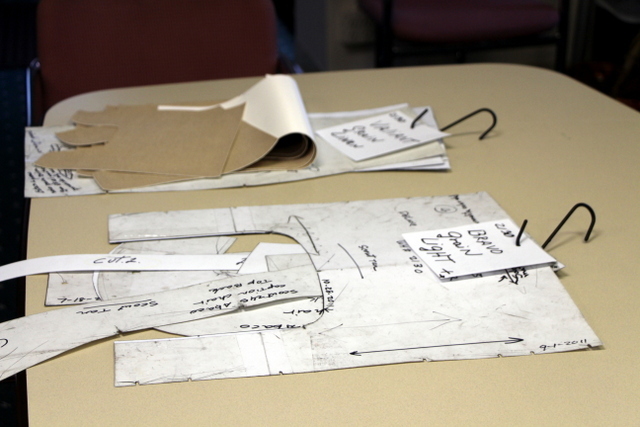 Before digitizing, gather all of the patterns for a single job. 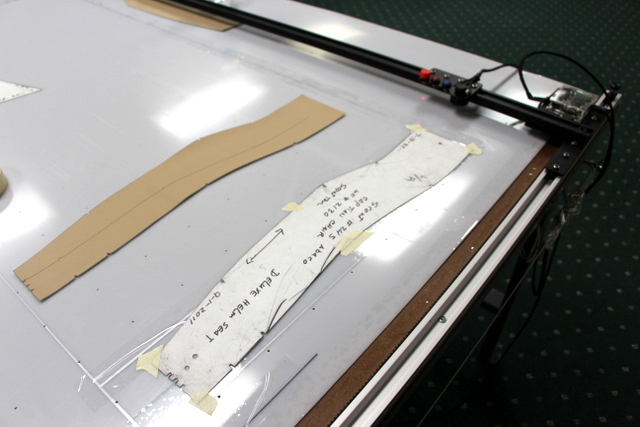 If the person digitizing is different from the person that normally cuts and sews these patterns, they should make sure they understand all of the pattern notes, markings, names, quantities, and orientation before they begin. 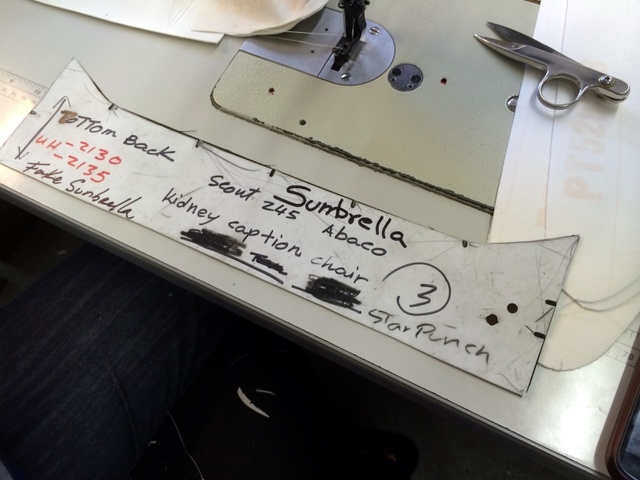 Rick is digitizing a seat set. Layout your patterns, check grain, check notes, and name parts. We trained their manager, Rick. When digitizing patterns, it’s important to establish a technique. 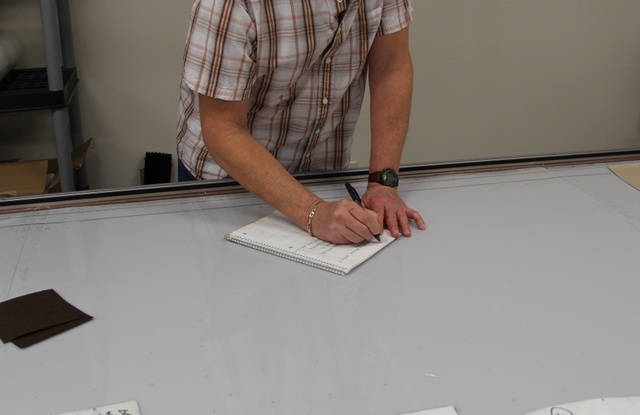 This was not Rick’s first experience with digitizing, so it took very little training for him to become proficient with the T-Bar. 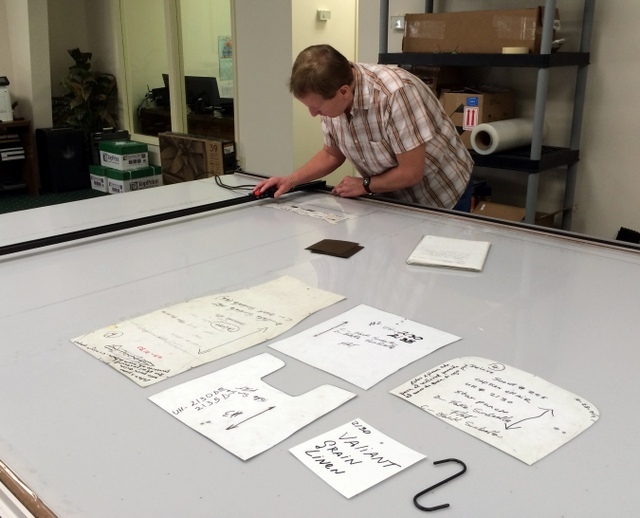 He observed almost immediately that digitizing on a large flat surface was, “much easier” than a vertical or wall mounted digitizing tablet. Digitized patterns show up in Plotmaster, ready to cut or edit. Patterns can also be exported in a DXF or HPGL file format. Plot/Cut your first patterns to "check" you are practicing good digitizing technique. Patterns Match. Look at those clean notches! Establishing good technique will allow the operator to digitize much faster later, without needing to check every pattern. 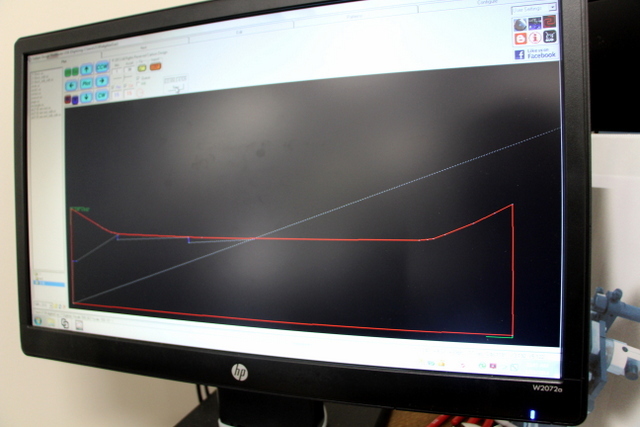 Digitized patterns are only as accurate as the operator, so it’s a good idea to know your tolerances. If you don’t know, ask the person sewing the patterns. The sewers know tolerances. The said, "this is perfect!". Don't spend too much time fixing something that isn't broken. Digitized lines are usually straighter and often better than the original pattern. She took one look at the pattern and declared, “This is perfect!” Rick reflected, “maybe I’m a little too critical”. Rick isn’t wrong to be detail oriented, but if you have a large pattern library, understanding your tolerances and technique will go a long way to helping you quickly (and accurately) digitize everything. Once patterns are digitized they should be named and nested. Organizing nests into small groups, allows the operator to quickly cut the necessary parts to fill an order. Here is a quick video of the CTx-72 cutting a nest for two seat sets: https://vimeo.com/84625316. Total cut time 5 minutes. Digitize a "V" for notches or a line for marks. 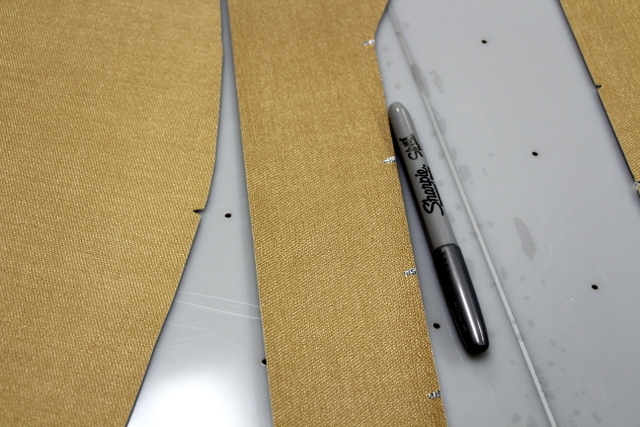 If the marks are within the seam allowance, you can use a permanent marker. Silver sharpies show up great on dark fabrics. 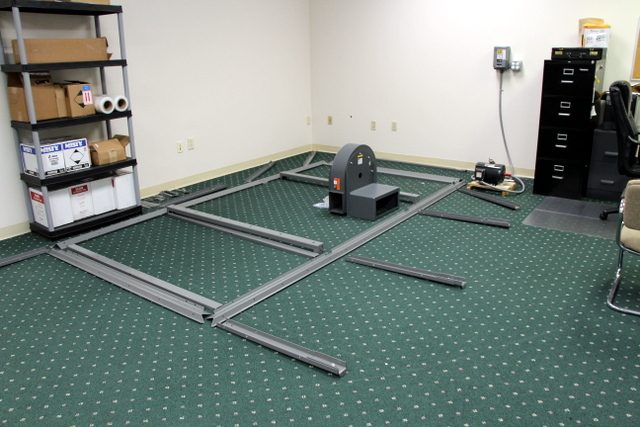 When getting started, test cuts help you determine the required pressure and speed for different materials. Record these in your user settings. Our blade holders magnetically mount. The 28mm steel rolling blade is excellent for cutting acrylic. 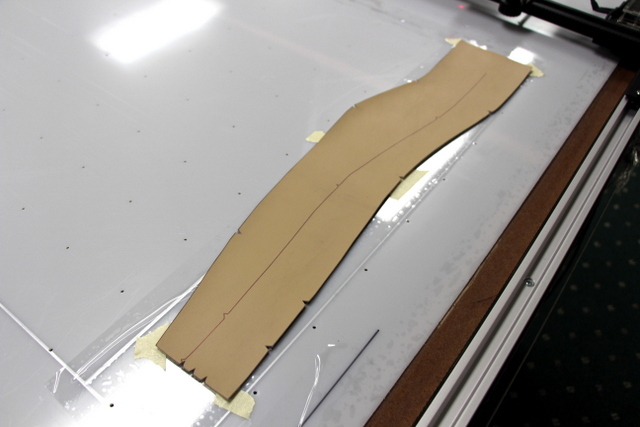 Use the carbide drag blade when making detailed notches in marine vinyl. 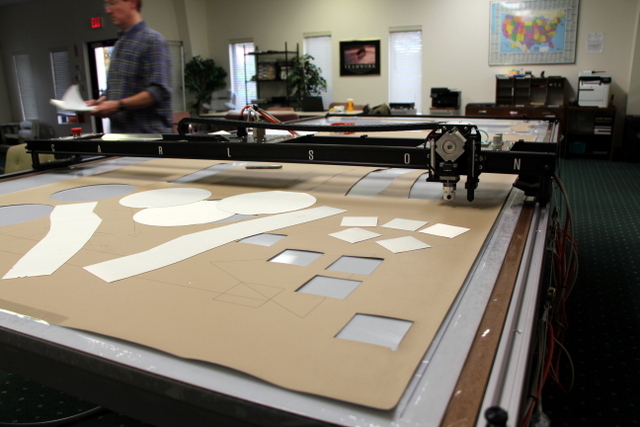 Our plotter/cutters are very simple and most operator's perform the same task again and again. Taking great notes during training will help you make great cuts, every time! 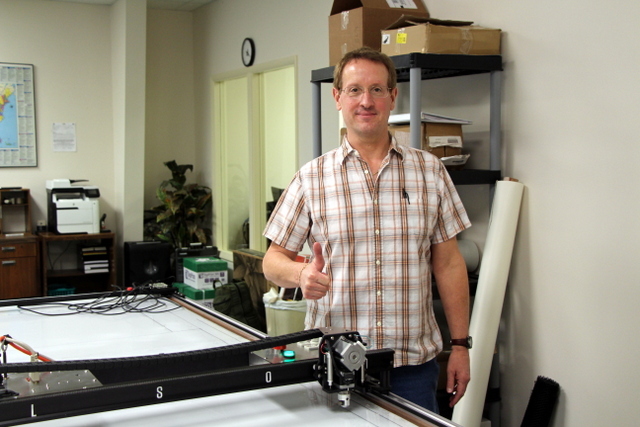 Rick can now train a full time or part time operator to digitize or run the plotter/cutter. 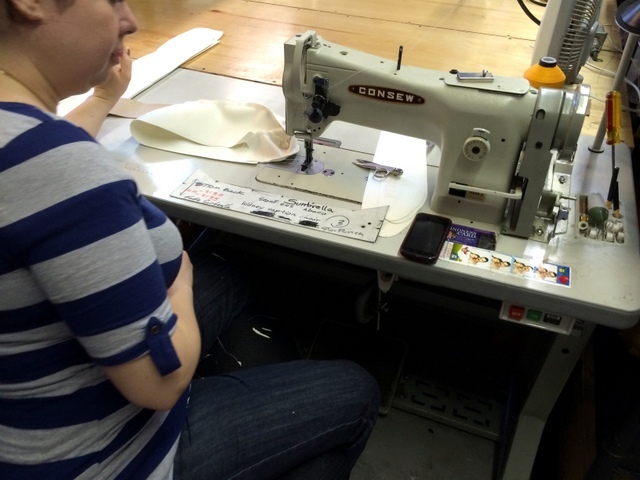 This turns Taco’s marking and cutting into an entry level position, allowing their experienced trades seamstresses and assemblers to focus on what they do best. CTx Glamour Shot - our standard multi-tool head features tool holders for marking and cutting. 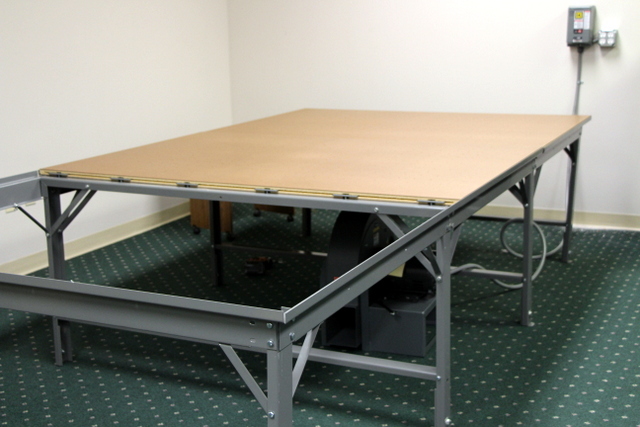 The 72" wide gantry will plot/cut up to 62" wide material. Simple cable management. 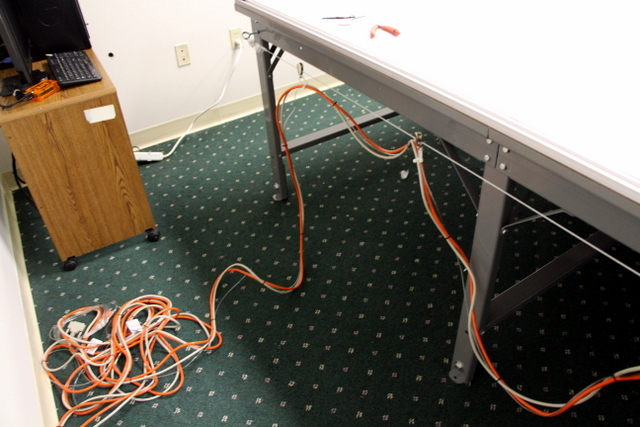 You can run cables overhead or off one side. Rick gives a big "Thumbs Up". The Plotter/Cutter arrives on a skid, however each individual component is light and small enough to carry through a standard 3' door way. 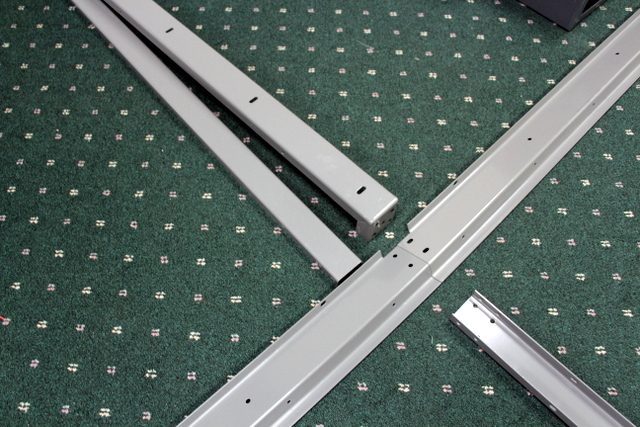 Layout your table frame. 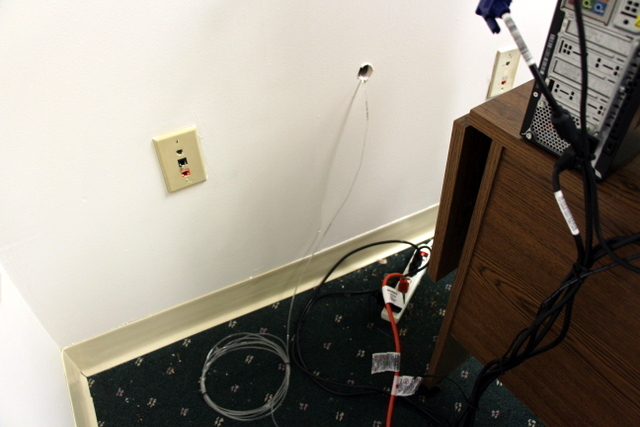 Their Blower was pre-wired with a switch mounted on the wall, before we arrived. Identify the table ends - they have a 45 degree miter. Endless sections: This brace is used to connect all "non-end" sections. Sort supporting pieces and place them around the table. 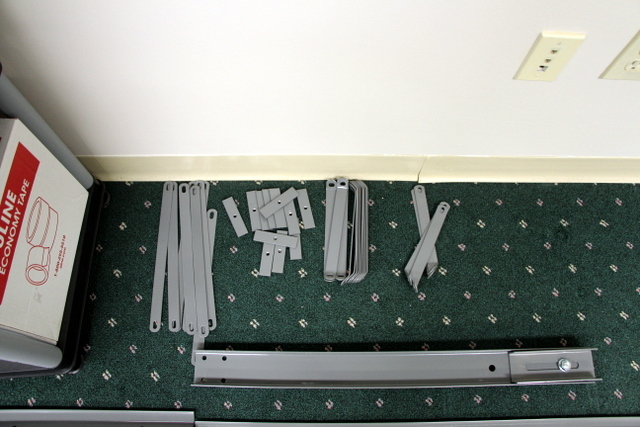 Laying out your parts before you begin will make assembly go much faster. Assemble the blower. 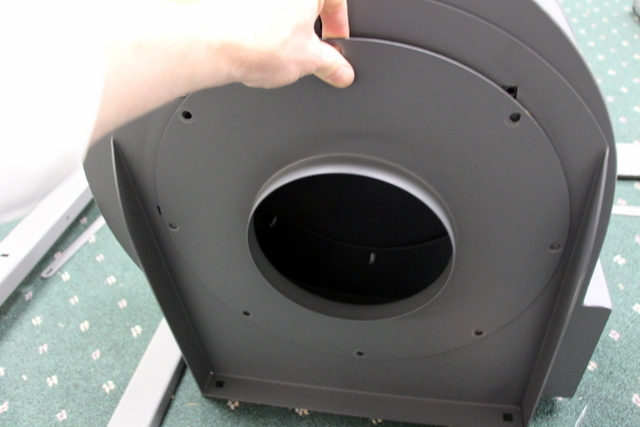 Start by removing the flange to access the fan blade. 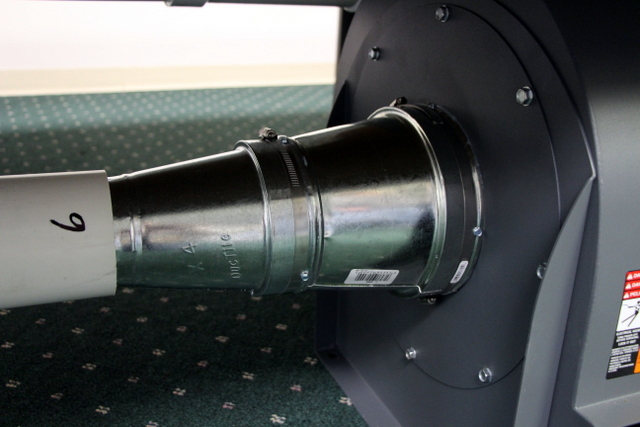 Place blower motor shaft through the housing and attach the fan blade. Insert key and tighten set screws. Re-attach the flange, now with the collar facing out. 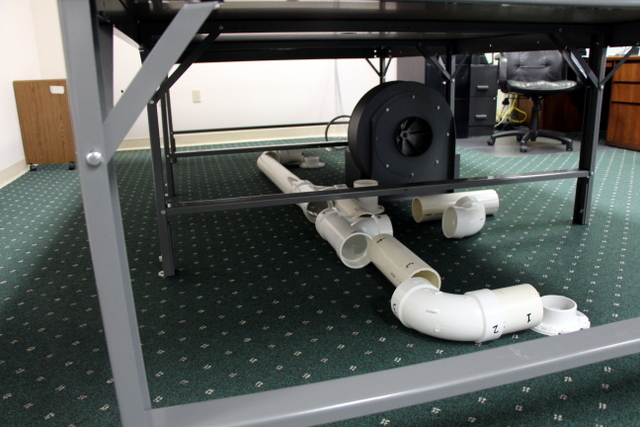 Taco Metals fabricated a "deflector" for the blower exhaust to prevent blowing papers on Rick's desk. Another option is to build a skirt around the table. 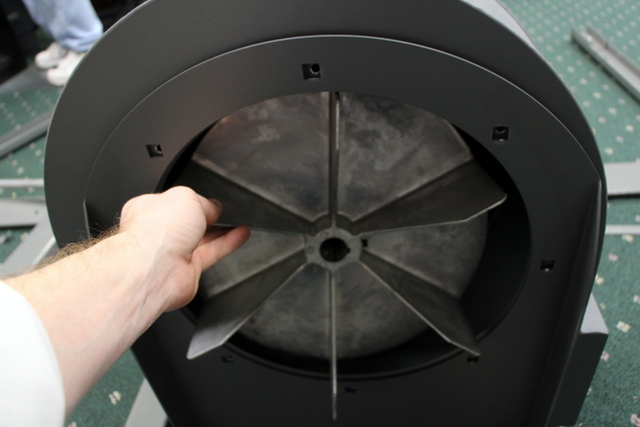 Manually spin the blower fan before turning it on to confirm it spins freely. Assemble table. Finger tighten all nuts and bolts. Position table before adding tops (ie before it gets heavy). Splines connect table tops. Do not tighten these until the table is level. Square the table frame and tighten all nuts. A magnetic level is very helpful. 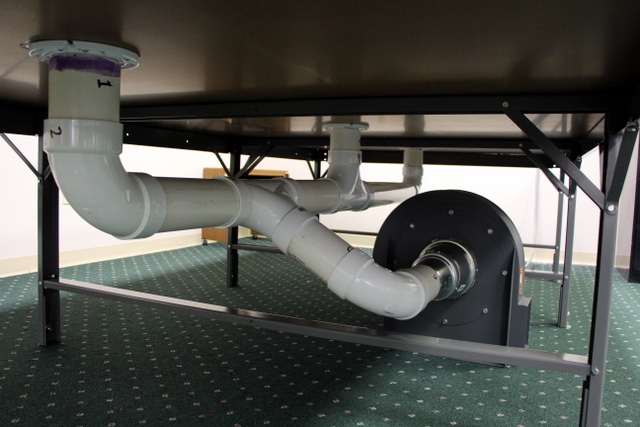 An 8"-6"-4" reducer set is provided to connect the blower to your 4" PVC plumbing. Silicone between the reducers to prevent vacuum leak and then use the #6 sheet metal screws to secure. Silicone flanges before attaching to table. 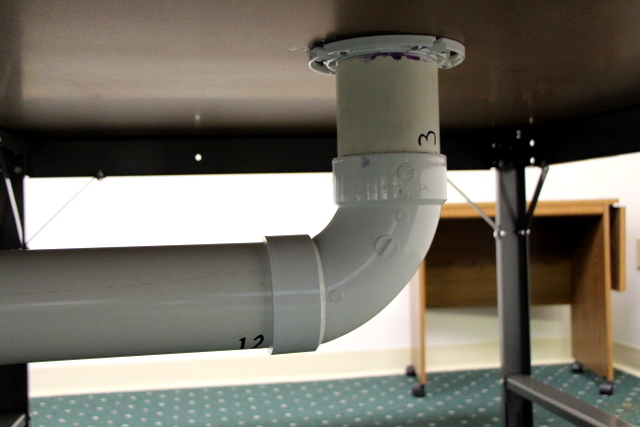 Use the PVC glue provided to attach the vertical components, like this 90 degree elbow, to the flange. Do not glue horizontal connections. Attach reducers to blower. Use hose clamps to tighten and #6 sheet metal screws to secure. 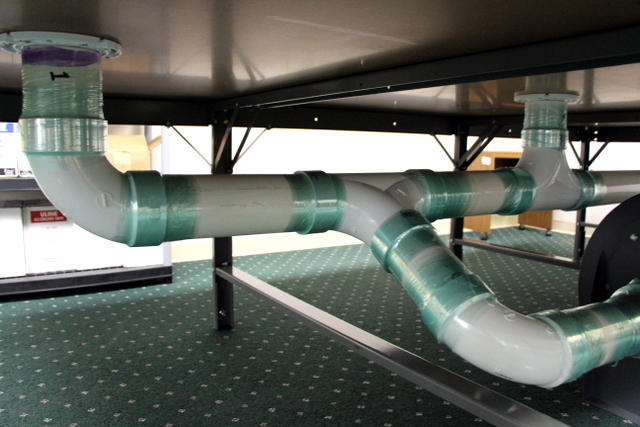 Plumbing connected. 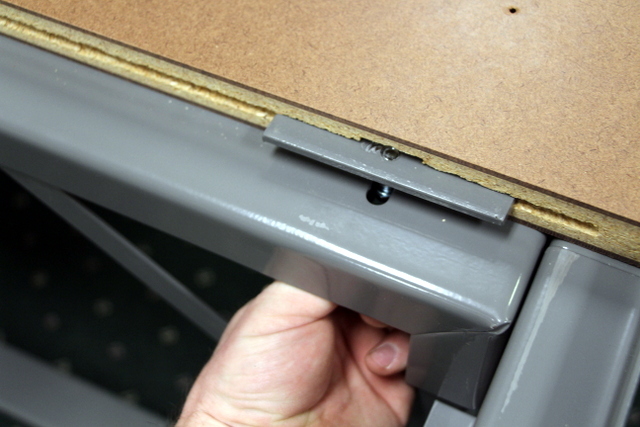 Not gluing the horizontal pieces allows you to reconfigure or move the table latter without re-cutting your plumbing. Not a bad idea for short tables. Since the sections aren't glued, it's a good idea to wrap them in plastic to prevent leaks. 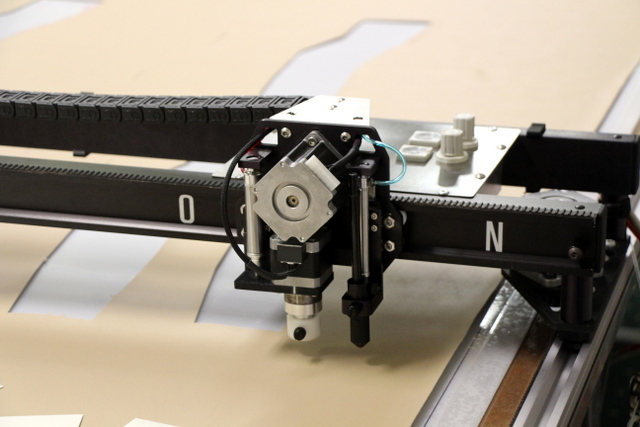 The plotter/cutter is connected by three cables: Air, Power, and Control. Zip tie these cables together, one every ~2'. Too many zipties can pinch the cord. 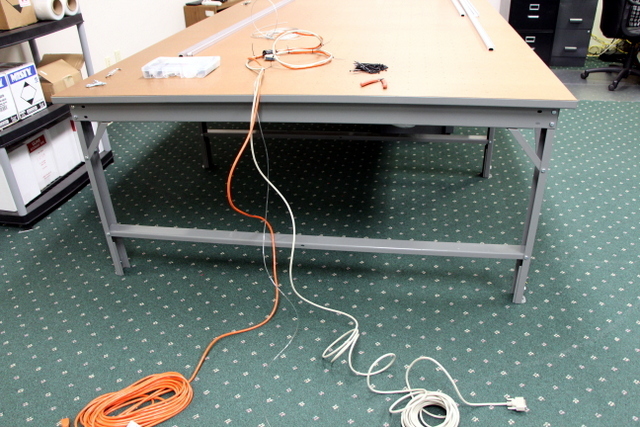 For tables under 28' we provide 50' of all three cables. Your cables can run overhead, in a side mount E-Chain, or connected to pulleys on a side mount wire. Tension the side mount wire with a turnbuckle. 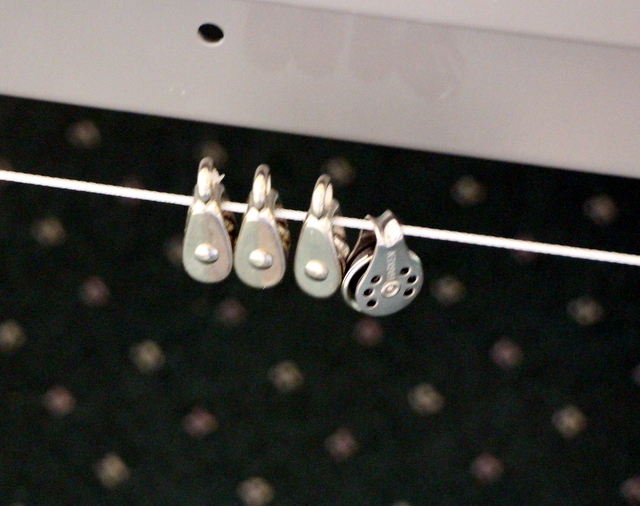 We like to use one pulley for every five feet. 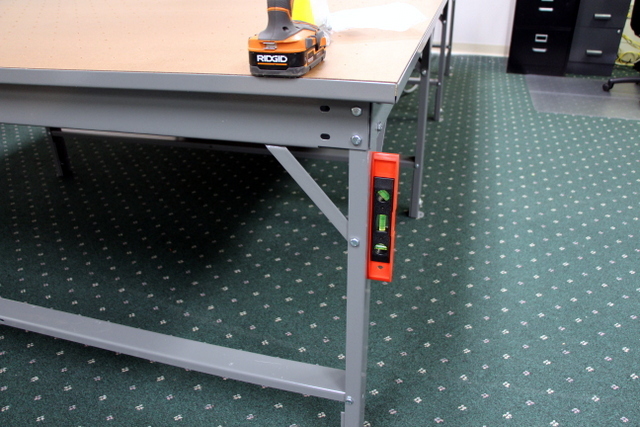 On a short table, adding more pulleys will make for a cleaner work space. 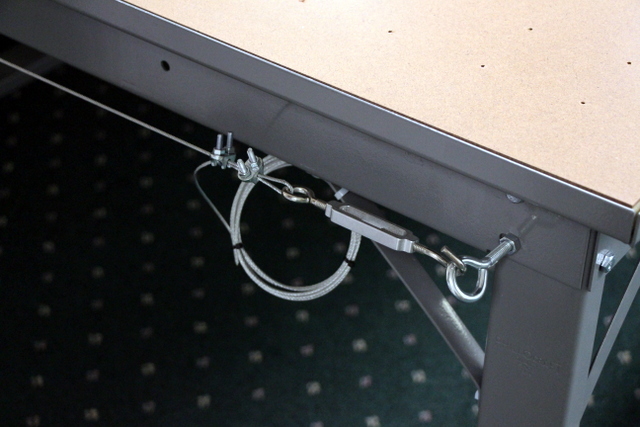 On long tables, it's important to use high quality marine pulleys. Attach track side A. Drill a pilot hole and tighten #10 x 3/4" screws by hand. 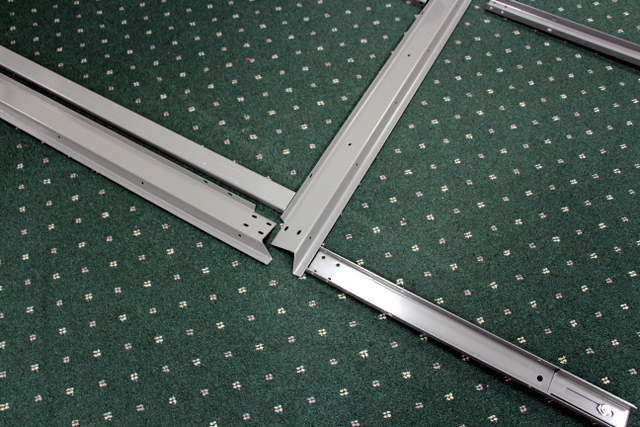 Adjust trolley to track before attaching side B. When "flicked" the trolleys should glide ~18" and have minimal slop side-to-side. Add mesh. 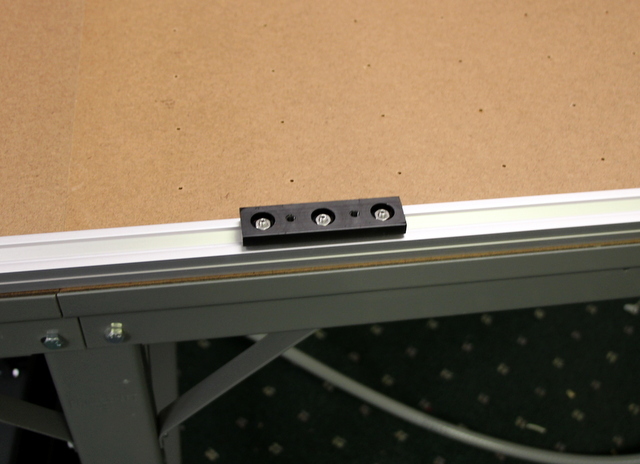 This creates a vacuum channel between your table surface and plastic cutting surface. Add plastic cutting surface. We recommend a 1/16" thick HDPE or Polypropylene. 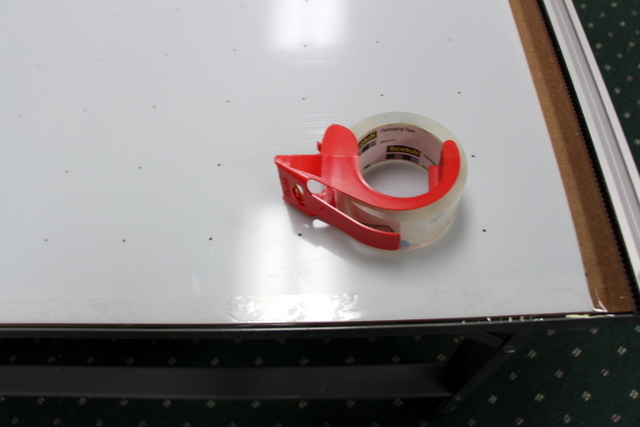 Secure cutting surface with tape to prevent leaks. You will be tempted to secure the cutting surface “permanently” — do not! The cutting surface is a consumable and as it wears you will flip it, swap ends, and eventually replace. 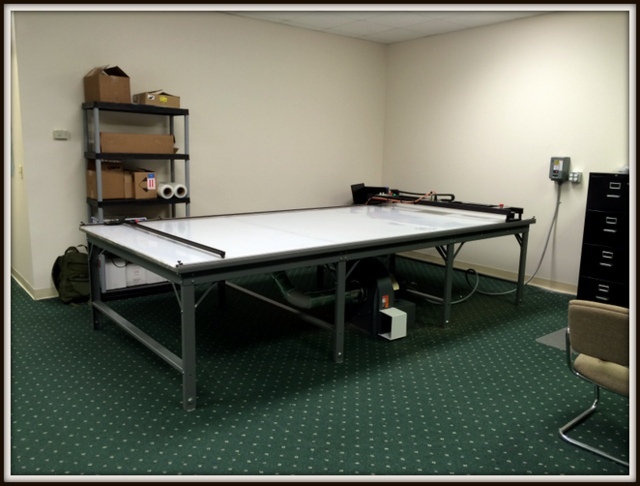 If your shop is not climate controlled, the plastic material will expand and contract with the changing temperature. In this case it may be necessary to allow the surface to “float” to prevent warping. You can use a thin strip of foam around the edges to prevent leaks. 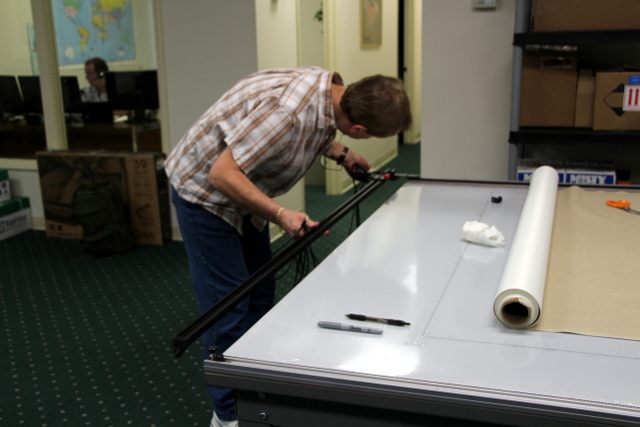 Secure cutting surface with packing tape or reinforced tape. 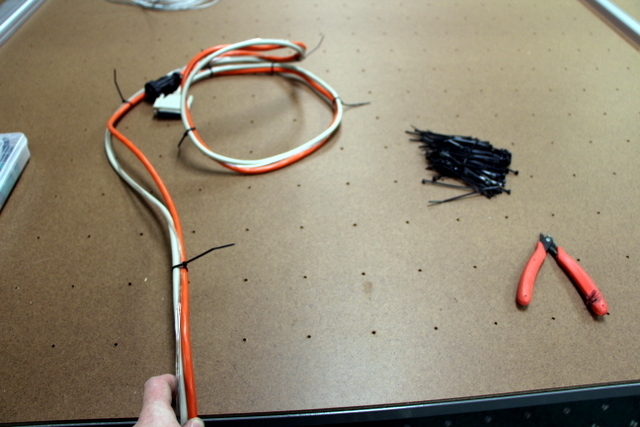 Attach control cable with zip ties. Taco Metals supplied their own PC. Plotmaster USB (PMU) will run on any Windows XP/7/8 PC. 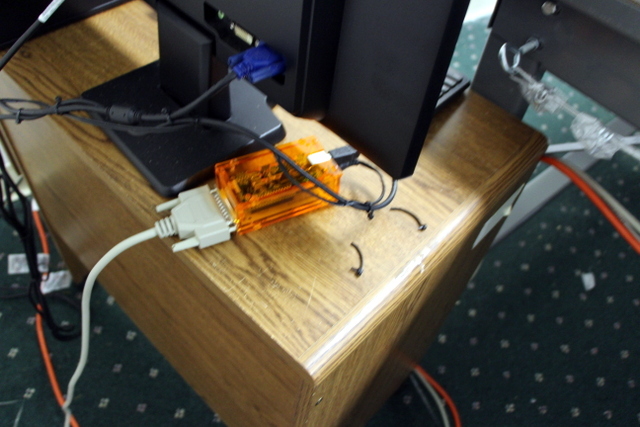 Our USB based software runs on any Windows PC. Our larger customers, familiar with purchasing big $$$ CNC equipment often ask why we don’t use PLC’s or on board screens/controllers/etc. We say, “NO WAY!” Using off-the-shelf computers puts reliability back in your hands. If your PC breaks, go to the local office store and get another one. 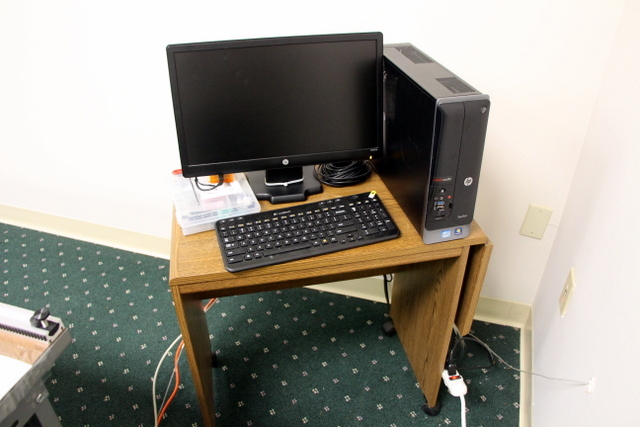 Use existing office furniture as a workstation for the first month. 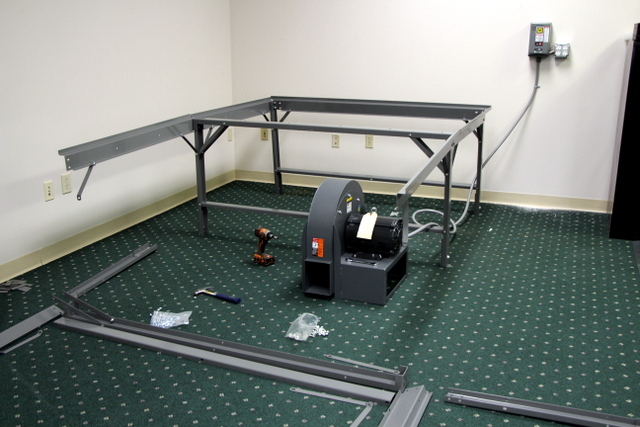 Once you understand your work flow and needs, get a nice wall mount or stand up workstation or check out our rolling cart workstation. PMU is available for download on any PC in designer mode. 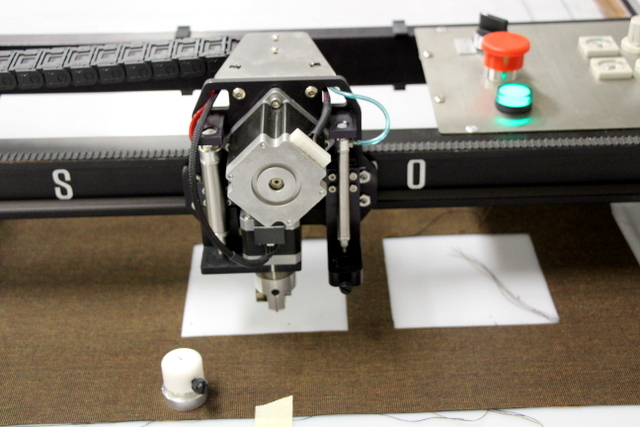 Connect the USB Controller to activate and drive the plotter/cutter. 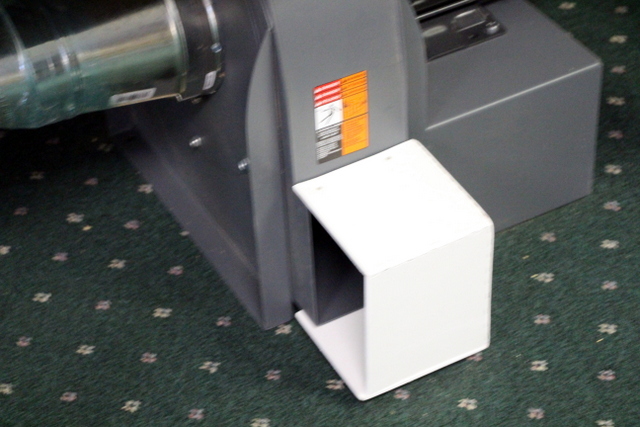 The plotter/cutter needs compressed air to actuate the pen and cutter. Min 1CFM @ 90PSI. They ran the air line through the wall to their main air compressor. 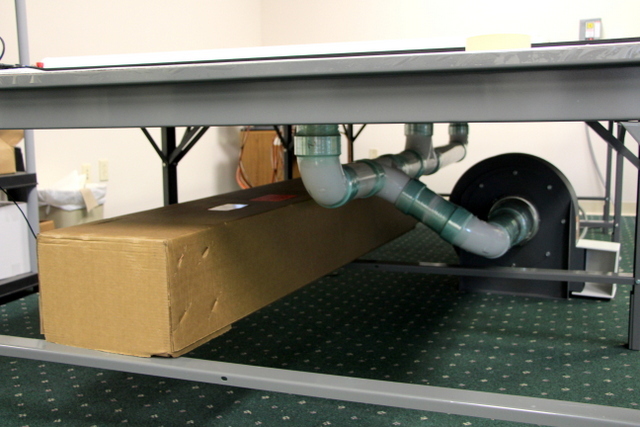 Save your plotter/cutter box under the table. 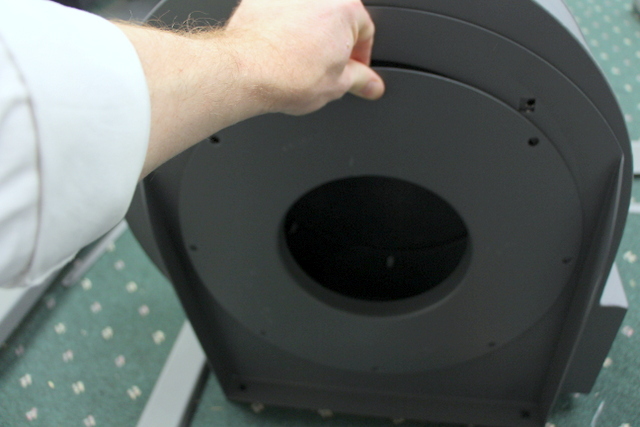 This is UPS/FedEx/DHL shippable should you ever need to return your system for repair.